If you are looking for a sophisticated data storage and anywhere access solution but don't want the high cost and low access speeds of the cloud, but thought that Network Attached Storage was for geeks only then think again. The myDitto brings NAS into your home and it really couldn't get any easier than this. When it comes to data storage and retrieval the current buzz is undoubtedly cloud-shaped, so why would anyone want to invest in Network Attached Storage? Two words: cost and capacity. Cloud services are great, but as far as storing and accessing large amounts of data is concerned things can get very expensive not to mention a little on the slow and clumsy side. Network Attached Storage (NAS) devices solve both the cost per Mb issue and that of access speeds. Unfortunately, setting up a NAS server to work how you want it has traditionally been a fairly complex business and one that has prevented all but the most determined home user (or those with a very geeky friend) from investing in the technology. Until now, that is. What Dane-Elec has managed to achieve with the newly launched myDitto Server is quite remarkable: this is a truly beginner level, three-step, plug and play NAS device. Seriously folks, not only do you not need to be a network engineer to set it up but you don't need to have one as a close friend you can call for when things go pear shaped either. 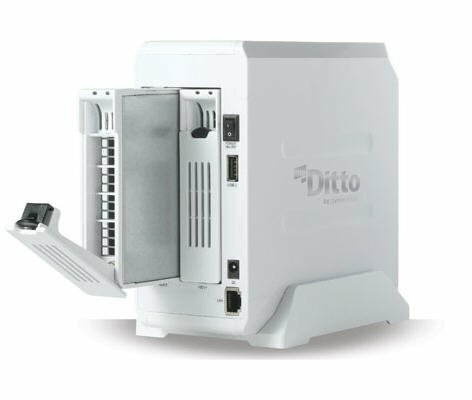 The amount of technical know-how required to set up the myDitto is approaching a big fat zero, and just requires three basic steps as follows:Plug the myDitto Server into your router and power it up. 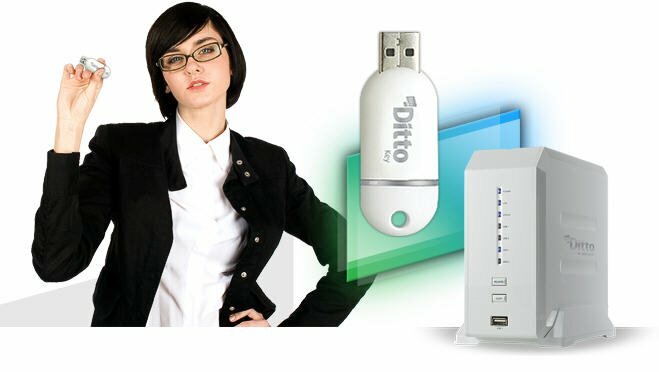 Now plug one of the supplied myDitto USB keys into your PC (or Mac for that matter) and run the supplied software to connect to the server initially and create a username and password. 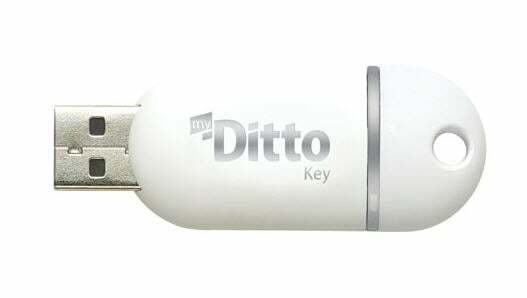 Finally use that key wherever you are to access the data on your myDitto, be it a PC or laptop. You can even access your data using an iPhone or Windows Mobile app, or install the myDitto software on your client PCs if you prefer. The myDitto comes supplied with a couple of these 2GB USB keys, a 'master' for basic admin tasks and a standard user one. These come pre-paired to the server for ease of use, but adding additional users and authenticating additional USB keys for them is as easy as you might expect from a device for which simplicity is everything. You can add up to 30 users, although only six can be connected to the server simultaneously. Dane-Elec sells key packs in sets of four, but you can actually use any USB thumb drive and it should work. Plug a key into the myDitto Server and press the copy button on the front of the device to pair it up; that's all there is to it. Revoking lost keys is just as simple, as long as you have the master key to access the admin console. Oh, and if you lose the master key you can even replace that by holding down both the front buttons on the myDitto and then putting another USB key into it which magically becomes the new master key. Sadly the simplicity aspect does wobble a bit when it comes to setting up the iPhone App as this requires the generation of a secure code on the desktop which has to then be manually entered on the iPhone and it's all a little bit too long and fiddly for my liking. Apparently plans are in the works to change this to a simple username and password approach soon, which will certainly be most welcome. Once connected, the iPhone App is a fairly simple affair but seems to work well enough if all you want is relatively quick anywhere access to your data. I say relatively quick access as it naturally depends upon your mobile network connectivity, and making the remote connection over even a fairly solid 3G mobile broadband line can be a bit slow but that's not really the fault of the myDitto and it's certainly no worse than using a cloud service via the same smartphone. Things also speed up when using normal broadband or WiFi to get to your data, or to get our data onto the myDitto for that matter. Not least thanks to the use of a peer-to-peer protocol which, as I understand, cheats DSL lines into thinking it is making a voice call rather than moving data around and so gets a higher priority from the ISP. To give you some idea of the times involved, and I must confess this is no labs tested number but rather just a back of a cigarette packet calculation so your mileage will probably vary, I saw the same 10MB test file move from myDitto to my Ethernet connected laptop in 35 seconds, to the same netbook via a WiFi hotspot in 50 seconds and to my iPhone over a solid 3G mobile network connection in a shade under two minutes. And talking of getting data onto the myDitto, this is just as simple as setting it up being a standard drag and drop from the desktop affair. I particularly liked the ease with which it is possible to copy the entire contents of a USB thumbdrive onto this NAS device. You just plug the USB stick into the front-mounted socket and press and hold the COPY button to kick start an automatic full copy process. The simplicity carries over to the security of the myDitto is use, but not at the expense of making your data insecure. Basic two-factor authentication by way of the physical USB key and a password is good enough for the average home user and even many a small business it seems to me. The key serials are stored in the cloud by Dane-Elec using 128-bit encryption, in case you wondered. And talking of security, let's not forget the security of your data in terms of backup. This is another area where the myDitto as reviewed shone in terms of simplicity and functionality. Supplied in a 1TB format, comprising two 500GB drives, it was possible by following the very simple instructions and using the master key to configure the myDitto (before adding any data, as it wipes the drives) as a RAID 1 array. While this does reduce the data storage capacity of the myDitto to just 500GB, it does bring peace of mind by providing a mirrored copy of everything on the first hard drive directly and automatically onto the second hard drive. What else? Well, I've had great fun using the myDitto as a media server during the couple of weeks I've had to play with it here, playing music files via an Xbox 360 for example. It has also acted very competently as an iTunes server, although I found the streaming of MP3 files to my iPhone a somewhat redundant feature seeing as the iPhone is also an iPod anyway. Unfortunately, as far as the current incarnation of the myDitto is concerned anyway, streaming video would appear to be something of a pipe-dream thanks to a lack of processing oomph in that department. Where the myDitto has really hit the spot, though, is from a family perspective. We can easily backup all our netbooks, including the dreaded schoolwork, to one central location where that data is automatically copied to another drive for additional security and peace of mind. What's more, every gets to access their stuff wherever they are just as long as they have their USB key with them. Great for when the kids are visiting friends, or the wife is staying with relatives. Best of all, I don't have to be around to provide the technical support when any of them need to do something different as the myDitto really is as easy as pie to work with. My 10 year old daughter even paired her own key and copied the contents of her USB data stick without hassle. It just works, and works well, as both a remote access data storage solution and a basic local network NAS device. On the downside, it doesn't come with any print-server functionality and any external USB drives connected via the rear mounted ports cannot be accessed remotely, only as local network folder shares. It's not the fastest NAS device in terms of read/write speeds, but if you want ease of use then investing in a myDitto really is something of a no-brainer. How do you delete data from broken hardware?